It could be beach pebbles or river rocks anchoring napkins in place, a simple row of posies in odd jars or tins in the middle of the table, or even novel place cards made by writing names onto pieces of citrus fruit, which are then plonked on the plate of each guest setting. Christmas and the summer season presents numerous opportunities to dress the tabletop with garden greenery or floral fun. 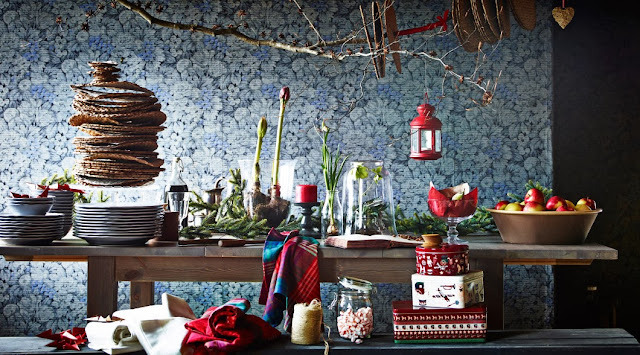 Here's what you can do with homewards Ikea suggests, with plenty of classic red and plaid table essentials. Other ideas could include glass candle holders wrapped in fern fronds and tied with grass; dried out and pressed leaves used as wine coasters; pieces of hollowed out driftwood filled with cacti or paper flowers; single philodendron leaves as placemats; sprigs of aromatic herbs or fresh mint clipped and ready for garnishing.